In the ten years, Russia’s total amount of greenhouse gases emissions went up by 10.7%; further growth by 11,2 % is predicted by 2020. Reasonable climate policy and adoption of internal targets on emissions reduction in the country could let Russia benefit from the international markets of low-carbon technologies and renewable energy sources. “Russian political leaders tend to point to the post-soviet decline of greenhouse gas emissions as a major contribution to global climate mitigation efforts. 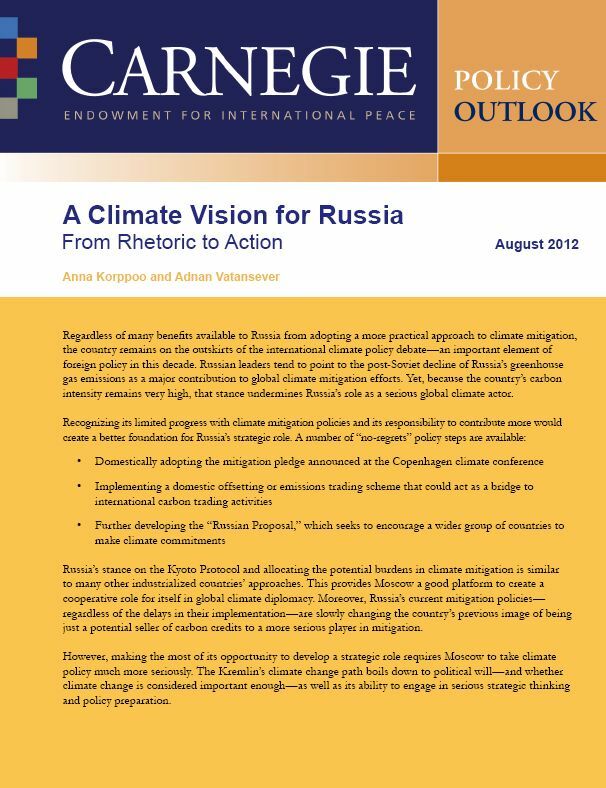 Yet, because the country’s carbon intensity remains very high, that stance undermines Russia’s role as a serious global climate actor,” European scholars Anna Korppoo and Adnan Vatansever wrote in their paper on “A Climate vision for Russia: from Rhetoric to Action,” published in the Carnegie Foundation’s “Political View” series. The authors acknowledged the important role of the Russian Federation in the climate mitigation process; however, they indicated its ambiguousness. On the one hand, thanks to its forest and marshes richness, Russia is the major carbon sink. On the other hand, country’s emissions caused by fuel combustion alone exceed all the emissions by Central and South America. Despite the fact that in 2010, CO2 emissions stood at 34.2% below their 1990 level, the world community does not have an impression that this reduction is an outcome of a targeted policy. Emission growth in Russia is going at a slower pace than in other developing countries only because it is provided with the high oil prices and not industrial development. European scholars stated that a steady trend of CO2 emission growth could be registered in Russia. In 1998-2010, the total amount of greenhouse gas emissions went up by10.7%. The International Energy Agency (IEA) predicts 11.2 % growth for Russia between 2009 and 2020. In comparison, carbon dioxide emissions in China and India are projected to grow by 41.4 percent and 47.7 percent, respectively. By contrast, emissions in the United States and the European Union are expected to decline by 0.2 percent and 4.5 percent, respectively. By the opinion of the paper’s authors, Russia has enough grounds to take the climate change challenges seriously. Data of various scholars and official information of Roshydromet (Federal Service for Hydrometeorology and Environmental Monitoring) confirm that the temperature in the northern territories, where the major part of the country is located, is going up faster than in the rest of the world. This increases climate risks for Russia as compared to other countries. Deforestation and the melting of permafrost as well as a growing amount of black carbon in snowcovered territories could have considerable implications for global and Russia’s efforts to effectively mitigate climate change. “However, Moscow continues to see the climate change as someone else’s problem and even claim that there is a Western conspiracy to force Russia to buy foreign green technologies,” European scholars wrote. “Russian policy makers practically ignore economic and human risks imposed by the climate change on their country.” By experts’ opinion, no actual actions on emissions reduction followed adoption of the Climate Doctrine in 2009. The document remained no more than a political declaration and never became a guide for action. That said Russia, by the opinion of the European scholars, is one of the few countries for which a well justified climate policy could create a broad variety of development incentives. Russia can provide itself with a place in the international market of low-carbon technologies and renewable energy sources. Further promotion of so-called “Russian proposal” targeted at extension of the list of countries with assumed climatic obligations. Tendencies and problems seen by European experts in implementation of climatic approaches in Russia are similar with the position of environmental NGOs, already not once announced.